CAT Tools In Literary Translation: What Are They Good For? 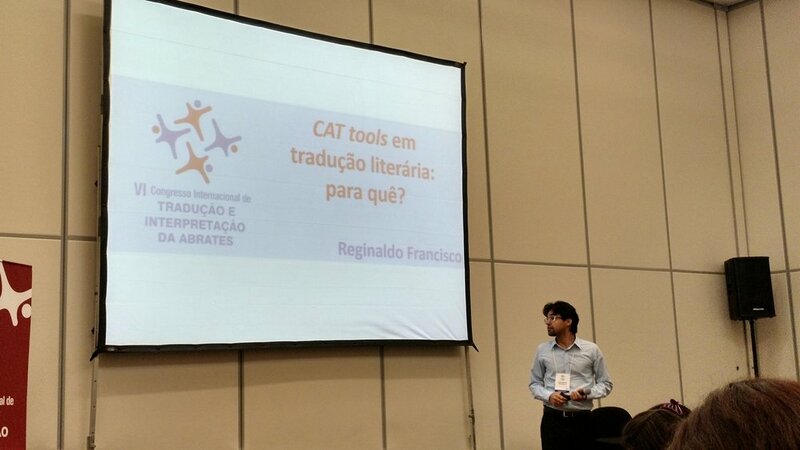 The first presentation I attended was the one by translator Reginaldo Francisco, who talked about the use of CAT tools in literary translations. Reginaldo highlighted the overall benefits offered by CAT tools, such as improved comfort and ergonomics, because translators don't need to use two screens or, worse, read the original straight from a paperback copy. Another improvement is how previous translations can be leveraged, because your work is recorded in a database and reused at a later time. Glossaries can also be compiled, so that key terms will be suggested automatically whenever they show up in the original. Besides, many of these programs help with typing as well with "auto complete" or "auto suggest" features that guess what you're trying to type based on the first letters being entered and the words most commonly used in the project. Reginaldo talked a little about some of the most popular tools, such as Trados and Wordfast, and explained that their classic version used to work within Microsoft Word by isolated segments on a document and providing a field where translators could type the respective translation. This combination of original segment and translation are then stored within a database to feed the translation memory. "These are good starting points, because the learning curve is less steep," he indicated when referring to the fact that many translators are already familiar with the Microsoft Word environment, and they'd only need to get used the additional menus and hotkeys that are particular to each tool. "However, the fact that they work within Word is the best and worst of advantages," he warned. "You may be used to Word, but you also get all the bugs that come with it." When demonstrating Wordfast Classic, Reginaldo compared it to the rule many of us have already used on top of a sheet of paper to indicate the line we're translating. With a tool of this nature, we benefit from improved ergonomics, because we avoid discomfort and the literal pain in the neck caused by looking from paper to screen. He then demonstrated Wordfast Pro, which is a stand-alone version of this tool and works within its own window, without resorting to an additional program. Reginaldo talked about looking up previous translations, be them at the sentence or vocabulary level, and how translation memories work. When talking about literary translation specifically, he recognized that a translator will very rarely find matches and repetitions within a memory database while translating a book. One example he did mention, from an Italian-to-Portuguese book he translated and that was written in a diary-like format, showed similar dates that were identified as matches, and it only takes translating the first date for the tool to understand the syntax and simply replace the number, while keeping the translation for the month. Still, he says that these tools are useful for consistency and quality assurance purpose, including character names, for example. Translators can also look up terminology by doing a search and finding all segments in which a given word was used, so that they can recall how it was translated throughout the book. Finally, making it a habit to translate books using CAT tools is something healthy for a translator's production control, because this type of software generates reports that indicate the amount of words translated and what's still left to translate, thus helping professionals organize their schedule.